Now that Microsoft Security Essentials, the new freeware antivirus from Microsoft, is generally available to consumers in 19 countries, Microsoft has had a chance to go over the data, and there are some very interesting results. Just in the first week Microsoft saw well over 1.5 million downloads of Microsoft Security Essentials, but the price (free to Windows users) is hard to beat! Computers reporting detections up to October 6: almost four million detections on 535,752 distinct machines. 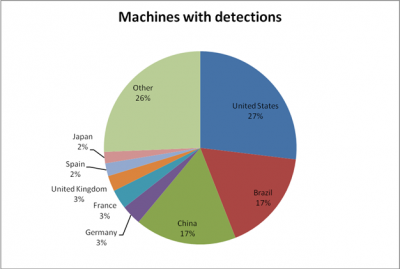 The detections are eight times the machine count because many computers are infected with multiple threats. Microsoft Security Essentials is available in 8 languages and 19 markets at RTM, which covers a lot of the PC using world. The geographic distribution of detections so far still closely follows the Microsoft Security Essentials Beta countries, and is ramping up in other countries that use the 8 languages. MSE is making a big difference to those people using it on their computers. We strongly recommend giving Microsoft Security Essentials a try. Read more at Microsoft Malware Protection Center.